Cold, wet and late getting home Monday night. First, build a fire, then all else will fall in place. Dinner needs to be hot and quick. Hamburger Soup. This is from my mother; it was an easy way to feed a house full of children. This recipe uses all my pantry/freezer items I keep on hand. I took a chance, as my first posting being such a humble offering as this. The bottom line: Food is love, and this is uncomplicated and plentiful, as both should be. Saute the diced onions, rosemary and ground beef until the onions are soft and the beef is no longer pink. Add the petite dice tomatoes and stir. Add everything else. Cover with the chicken stock or water and bullion and bring to a boil. Reduce to a simmer, stirring occasionally until the vegetables are tender, 20 minutes or so..
Add good bread and butter, and dinner is served! *once you start using this short cut, you will wonder where they have been your whole life. This entry was posted in Recipes and tagged beef, Dinner, ground beef, soup, winter vegetables. Bookmark the permalink. Purchased the ingredients for this today and look forward to making it tomorrow night! Thanks, Emily! Yumm ! A good hardy meal for a cold winter day. It will be cooking this weekend!! Thanks for taking a look, it is one of our favorites! I made this delicious soup on Thursday night with plenty of leftovers for another fantastic meal! It turned out great and will definitely be a staple winter dinner for us. 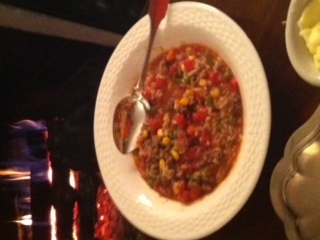 So glad you liked the Hamburger Soup, yes the abundance of leftovers are a big plus with this recipe.